Your garage is not just a small building where you park your car. Depending on your lifestyle, you may spend a great amount of time in your garage. Whether you are using your garage for storage, hosting a get-together, inviting friends over for a game of pool, or just relaxing, it can be a haven from the hectic life that many of us face every day. During this time of year, you may be planning to see how you can update your garage to better meet your needs, and you are probably wondering when the best time would be to build a new garage or renovate your old one. Late winter and early spring is a great time to start building an addition to your home. When the ground is frozen, and the air is dry, it can be easier to dig a foundation and pour concrete footers. Many homeowners make the decision to build a new garage in the spring or early summer. Implementing new ideas during this time allows them to get the most use out of their garage throughout the summer and fall. However, since spring is considered to be home-building season, the cost of labor and materials for your garage may be greater during this time, due to higher demand. In the summer and early fall, it is a good idea to work on roofing projects for your garage, since roofing materials must be exposed to higher temperatures to properly seal. Most homeowners would like to have their garage building and remodeling projects done by the end of the year. During the fall, homeowners may want to remodel the inside of their garage, ensuring that it will be ready in time for Thanksgiving and holiday gatherings. Building or renovating a garage can be a complex undertaking. When preparing for your garage project, you will want to design a space that will meet your needs, estimate the costs required, obtain any necessary permits, ensure that the foundation is properly built, plan for framing the building, choose the right materials, and determine the style and materials of doors. The cost of a new garage is usually between $30 to $55 per square feet, depending on the materials used. A one-car garage will typically be around 240 square feet, and a two-car garage will be around 380 square feet. If you do the framing of your garage yourself, using a wood or steel frame kit with pre-cut materials, you may be able to save on the costs of labor and complete the project more quickly. 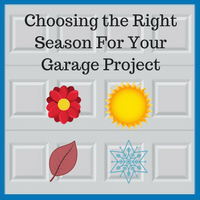 As you plan for the upcoming year, you will want to be able to get the most out of your garage. If you have any questions about how to get started on your garage project, Blue Sky Builders can assist you with your unique needs. For over 39 years, Blue Sky Builders has provided top-notch service to our Chicago and DuPage County area clients, and we can help you create your ideal garage solution. Contact us today at 630-852-8485. To view some of the great garages we have built, please visit our gallery.